U8 evaluations are held in the Fall coinciding with the formation of the DYHA house league. Participation is limited to DYHA members only. 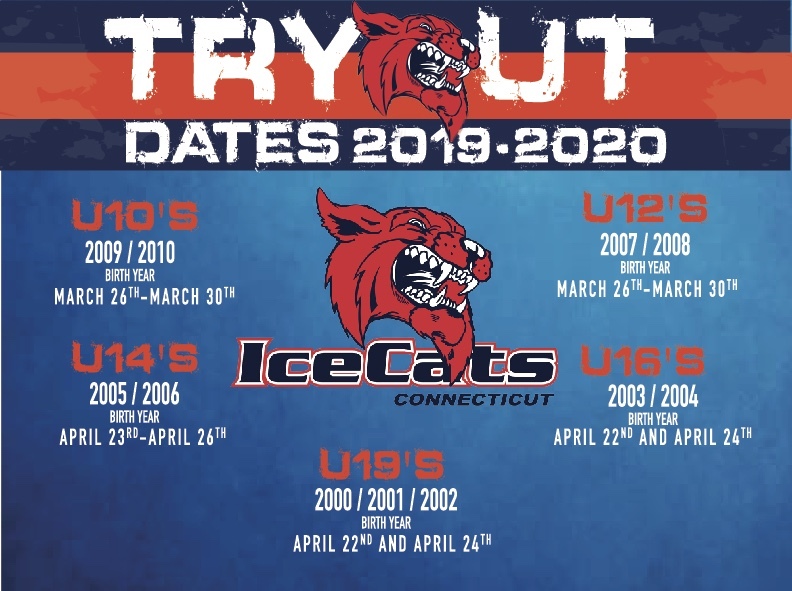 The Ice Cats are an established, competitive Tier 1 and Tier 2 program which began in 2000. The DYHA Girls teams were merged with the New Canaan Winter Club in 2009 and are currently called the CT Ice Cats. Nine teams in the last 5 years have qualified and competed in the New England Regional Tournament, bringing home 5 Gold medals & 4 Silver medals. The U12 team has qualified for and competed in the Tier 2 national tournament in the 2009-2010, 2010-2011 (national quarter-finalist) and 2011-2012 seasons. The goals are to field competitive teams, develop all players’ skills and knowledge of the game, and have FUN. Each team has approximately 17-20 players with the developmental teams taking larger rosters. U19/16 – Late August - late November. Once practice and one game per week. Provides a place for older girls to continue their skill development without a huge commitment that would otherwise conflict with other high school sports. Requires a full (20 player) roster because the girls have other activities. U14A/B & U12A/B – September through Early March (League/Regional Tournaments in March): 2 1hr practices/week with 2 games/weekend (1 home/1 away) - 1/day except at tournaments and rare occasions. Two (2) tournaments/season. Typically Late Fall and MLK (or Feb. weekend). No required skating over Christmas break. February break commitment is unknown until State Tournament dates are posted. U10 – September through February: Practice ~3-4/month on a weekday or weekend. 15-18 games/season. two game most weekends. Travel under 1 hour. Typcially participate in local jamborees. U8 – November through February: Practice ~2-3/month on a weekday or weekend. 12-15 games/season. One game most weekends. Travel under 1 hour and games are scheduled not to conflict with House Hockey. Typcially participate in local jamborees. Players who have not previously skated for DYHA or NCWC (and have not cleared the waitlist) are welcome to come to tryouts. They will be considered for the team only if they are one of the strongest players in their age group. This will be determined by input from the coaches and Board representatives present at tryouts. Final determination is subject to a Board vote. All team members are expected to be fully committed and attend all practices and games. Absences due to fall sports are permitted on a limited basis until early November. Absences for U14 and U16/19 players for an in season High School sport team conflict are understood.